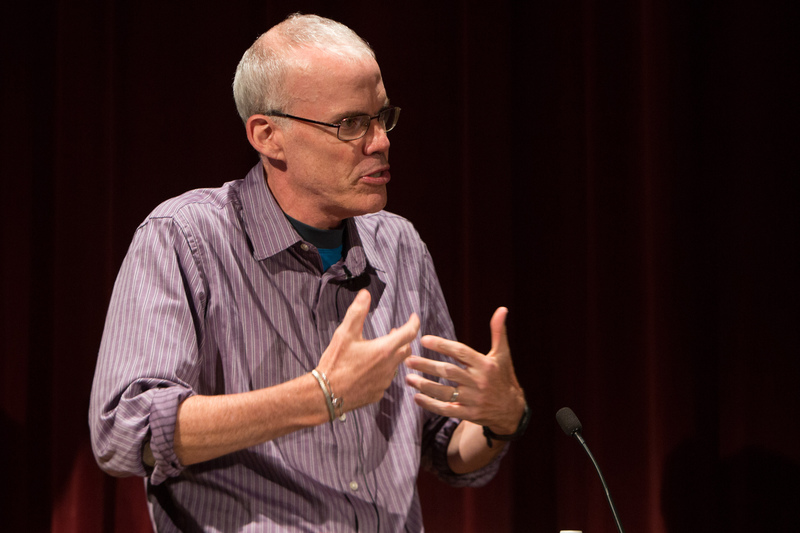 Bill McKibben during his September 8th talk at Lesley. Photo by Mark Teiwes / Lesley University. McKibben wants everyone to know that the climate crisis is very serious and cannot be ignored. “Today the World Meteorological Organization showed that CO2 levels in the atmosphere spiked sharply upwards against last year. Ice caps are melting, sea level is rising, and weather growing more extreme. And that’s with one degree globally of temperature increase. The forecast for the rest of the century is for 4-5 degrees. This means agricultural production will decrease – for example, people living in the countryside in Russia are already beginning to move to the cities in search of food. (Soon) we are not going to have civilization as we know it,” he warned. In a conversation after his talk, he told me that the key message he wants the audience to take away from his lecture is that there is a wide range of people from around the world who are ready to take action to change the trajectory of our planet. Organizations such as 350.org, the planet-wide, grassroots climate change movement that he founded in 2007 with a group of university students from Middlebury College, are building climate-focused campaigns, projects and actions led from the bottom-up by people in 188 countries. “We are 44 years removed from 1970 and while I cannot be sure, I do not think we have another 40 years to save the earth. So, what must we do now to exercise a healthy responsibility for planet earth? In addition to altering our interactions with the earth, we need to exercise intelligent collective action. The CLAS Read-in is one important step. It is not just about the book; it is about sensing a collective movement to do the right thing for the right reason. It is ultimately about sustaining a planet and world civilization. I worry about the specter of environmental refugees roaming the planet in search of safe passage and protection. I worry about poor nations falling off the face of the earth. This worry is a healthy response to global warming and its power to alter our lives and our planet permanently,” she said. During the Q&A session which took place after the talk, Storey asked McKibben what he thought the prospects are for a substantial global agreement in Paris at the end of 2015. Like many, McKibben thinks the chances for an agreement with teeth are slim, but they increase the louder and more persistent–and more demanding–the public is. In particular, he noted, part of a successful agreement would be a plan to help developing countries “skip” or “leapfrog” the stage of carbon-intensive energy production on their path of development; because if China, India, and other populous countries on the move to start living like Americans–eating more meat, driving more cars, using more air conditioning, etc.